Humans are gregarious by nature, and little human beings are no exception. Preschool age children thrive when learning in a community. Experts around the world agree that “children learn about themselves and construct their own identity within the context of their families and communities” (DEEWR, 2009). Montessori school philosophy seeks to develop well-balanced individuals by effectively combining socio-emotional and cognitive-skill building activities all in one place. Our Preschool in Poway takes pride in providing appropriate social activities for our students that help them explore and further their developing identities. Events such as our Halloween Carnival, and upcoming Thanksgiving Feast are carefully designed to promote our student’s social and cultural development. Belongingness. Community activities that encourage preschoolers, families, and staff to work together facilitate the development of children’s sense of connectedness to the environment that surrounds them. Enjoyable and purposeful interactions with their peers and neighbors help them recognize themselves as important contributing members of their communities. Identity. By actively participating and contributing to their communities, preschoolers start to explore and cultivate their own identities. Meaningful interactions help young children develop a sense of self, discover their place in the world, and understand the way their communities functions. Relationships. Children’s relationships with their peers, families, school staff, and neighbors are strengthened by enjoyable frequent interactions in the community. It is through these interactions that preschoolers learn to trust others and acquire the social skills needed to establish healthy relationships in the future. Culture. Carnivals, parades, community feasts and other similar activities help advance children’s appreciation of culture and diversity in their communities. Experience is a great teacher and when preschoolers participate in these activities they are not only having fun but they are also learning about the social norms, shared values and traditions of their communities. Academic Achievement. Montessori style education promotes outstandingly superior development in academic achievement during the preschool years. Social Cognition. Children’s ability to process their thoughts about others and themselves and relationships to others develops more rapidly in Montessori school students. Growth Mindset. Children learning in a Montessori environment were more likely to have a growth mindset by the end of their preschool years. School Enjoyment. Montessori students are generally more positive about school-related activities. The Halloween Carnival is put on by the Parent Teacher Committee. It is held the Saturday before Halloween. There are carnival games, a cake walk, a bounce house, crafts and a food truck. The highlight for many is the Haunted House which is put together by a team of parents. Parents volunteer at all the stations. The students and many parents all come in their Halloween costumes and fun and laughter fills the air. This is an event that families look forward to in their years in the school and look back on with good memories. The Thanksgiving Feast is held the Friday before Thanksgiving. Parents cook turkeys and tater tots. Early Childhood children peel and core apples for the apple sauce and the Elementary students make pumpkin bars. Each classroom sets up and decorates their tables, siblings eat together and the Elementary children go back to their Early Childhood classrooms. The children and staff remember this time with much fondness. 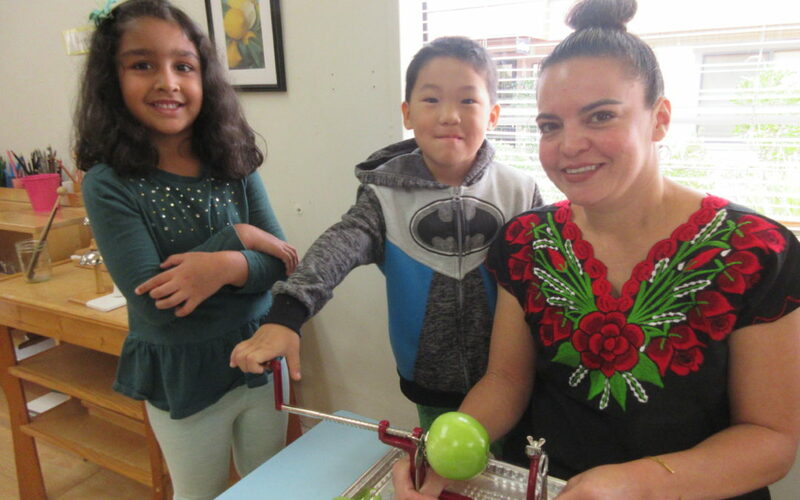 Country Montessori preschool in Poway is committed to advancing children’s cognitive and socio-emotional development by providing enjoyable activities that foster their sense of community. These traditions started at the opening of the school 29 years ago and continue today. These events emphasize the importance of community and developing a sense of belonging. We have a very diverse student body and we acknowledge each of their cultural celebrations with crafts, activities and food. Come join us!